petition: Plastic Bags Are Killing Our Endangered Whales. It's Time to Ban Them. Plastic Bags Are Killing Our Endangered Whales. It's Time to Ban Them. Last year, people were saddened all over the world by images of a dead sperm whale in that had apparently died of ingesting too much plastic. The 31-foot cetacean washed ashore at the Wakatobi National Park in Indonesia with a belly stuffed full of plastic debris. All in all, the whale had more than 1,000 plastic items swimming around in its stomach. Indonesia, in particular, is one of the worst contributors to plastic debris in our oceans. But that doesn't mean we Americans are guilt-free. Take the similarly shocking story of a young endangered sei whale found near death off the coast of North Carolina. The whale eventually had to be euthanized as it was too weak to be reintroduced into the ocean. After it had been put down, officials performed a necropsy on the animal and found that it was extremely skinny and hadn't eaten for quite some time. They also found pieces of plastic bags — like the ones many of us use every day — lodged in its throat. While authorities can't be sure the bag was the cause of its poor nutrition, it likely contributed to its demise. According to the Center for Biological Diversity, Americans use 100 million plastic bags a year. These single-use, rarely-recycled tools can easily end up on the ground, in our rivers and lakes or, worse, in our oceans. And in a state like North Carolina which borders the sea, that means plastic bags could potentially cause serious damage to our seas. 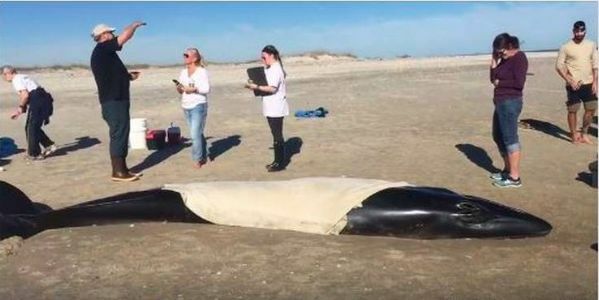 North Carolina officials should take a moment to reflect on the death of this poor whale and the damage plastic bags are doing to their oceans. Other coastal states like California and Hawaii have taken action against the plastic menace and passed statewide bans that force consumers to use alternatives to transport their grocery items. North Carolina should do the same. Plastic bags, which are not biodegradable, pose a serious environmental risk. They pollute our land and water, hurting animals, birds, and marine life. Plastic bags are also a huge contributor to climate change since they are mostly made of polypropylene, a material made from petroleum, which creates greenhouse gas emissions. There really is no use for single-use plastic bags. So let's get rid of them state by state, once and for all. Sign now and tell Governor Roy Cooper and the NC Legislature to pass a plastic bag ban now!